Cast your mind back to 2009, when conservatives suddenly became quite concerned about executive power. They channeled their rage into Obama’s czars. These were special advisers to the president, who helped set policy from inside the White House, rather than at the cabinet level. The White House health-care czar, Nancy-Ann DeParle, appeared to have greater input on Obamacare than Health and Human Services Secretary Kathleen Sebelius. The energy-and-climate czar, Carol Browner, advised the president more regularly than then–EPA chief Lisa Jackson. Flash forward to 2016, and Donald Trump is busy announcing czars. He added two yesterday: activist investor Carl Icahn as an adviser on deregulation, and economist Peter Navarro as a trade-policy czar. Neither will go through Senate confirmation. Icahn will reportedly not be a federal employee, which will keep all of his communications privileged. Financial vetting has been extremely slow for the cabinet choices; Icahn won’t need to jump those hoops. Every concern expressed about Obama’s czars hold for these appointees as well. I eagerly await congressional hearings on the matter. Icahn’s model of predatory capitalism would be disastrous as a regulatory framework. But Trump doesn’t really need Carl Icahn to tell him to cut regulations: House conservatives have a detailed list of 200 rules they want gone, everything from preventing conflicts of interest in investment advice to allowing widespread transportation of kombucha tea. In fact, Icahn is probably less stringent on this point; he has said he wouldn’t want to repeal Dodd-Frank, unlike House and Senate leaders. The real point of the Icahn appointment appears to involve insider trading. 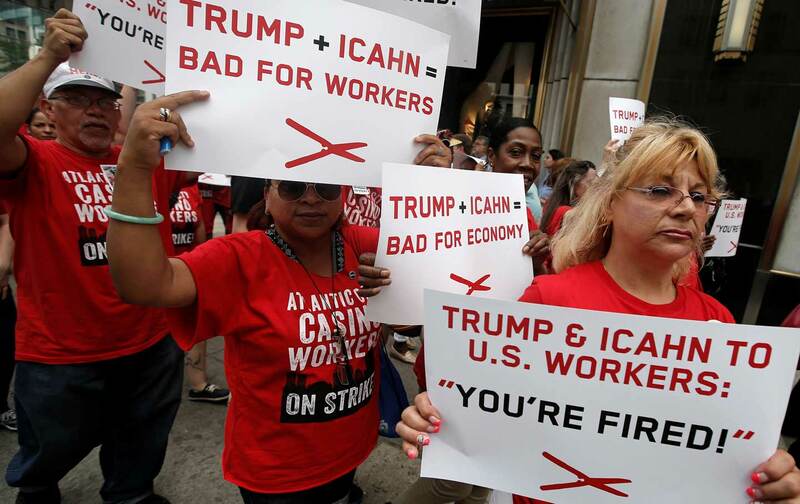 As a non-government employee, Icahn is free to maintain his business holdings, while advising the president on regulations that could directly affect those holdings. This is why Icahn’s more of a deregulator on environmental rules than financial ones; he has heavy investments in oil refineries and energy companies. Now, instead of complaining to the media about some EPA rule, Icahn could simply tell the president to kill it, and profit from the aftermath. It’s actually worse than that, because Icahn’s new foreknowledge of regulatory policy would be an invitation to use that information in stock-picking. The Navarro pick has a deeper policy focus. A professor at Cal-Irvine, Navarro is a China hawk, right down to creating a movie called Death by China. He (not wrongly) criticizes China for cheating on global trade rules and manipulating its currency (and yes, this is still happening) to benefit their exports. Along with commerce-secretary nominee Wilbur Ross, Navarro authored most of the Trump campaign economic plans, with a particular focus on trade. This cements an aggressive strategy of wiping out the trade deficit by confronting China and other export-heavy nations, including with tariffs (Chief of Staff Reince Priebus has been telling business leaders that a 5 percent import tariff by executive order could happen). The current left-liberal critique of free-trade agreements is that they are more of a guarantee for corporate profits than a mutually beneficial trade policy, without a durable enough safety net for workers who inevitably lose out in the exchange. Tariffs to protect US industry introduce a whole new debate, and will surely occasion shouts about trade wars. Though Navarro believes that cutting the trade deficit automatically leads to growth, there definitely can be negative effects, most readily seen in the price of goods (though a 5 percent tariff may be too small to matter much in either direction). At the same time, persistent trade deficits really do hurt domestic workers. Any discussion of whether the Trump plan will benefit the United States needs to weigh against the devastation wrought by the neoliberal trade consensus since the 1970s. Perhaps more important, the Navarro pick also signals a sidelining of the US trade representative (USTR) before the position has even been filled. Trump’s team already signaled that Ross would anchor trade policy from Commerce. Ross clearly has a working relationship with Navarro from the campaign. Now Navarro will run the newly originated National Trade Council in close proximity to Trump, with Ross doing the high-level negotiating. There’s not much left for a USTR, and the candidates willing to take charge of a neutered agency are dwindling. That’s not really a bad thing. One persistent problem with having a US trade representative’s office is that it’s stocked with people with a mission to write trade deals. That gives lots of forward momentum to the kinds of corporate-friendly policies that haven’t produced for US workers. Plus, the USTR gets direct input from trade advisory committees, composed mostly of interested business groups. Eliminating that lobbying through-line would be a step forward. The problem, however, is that the USTR isn’t being eliminated. The office will clearly be subordinate to Commerce, but will still exist as an independent agency, managing technical aspects of trade and taking in information from business advisory groups. Here, like with maintaining fast-track trade authority, Trump lacks the courage of his convictions. He’s taking policy out of USTR but keeping it open as a back door, available to quickly make trade deals that multinationals can accept. Obama actually tried to consolidate the USTR with several other export agencies two years ago, and dissolve the Commerce Department; the plan went nowhere. Congress likes having agencies to oversee and doesn’t want them going away. But Trump claiming to overhaul trade policy while sustaining damaging components of the past intact keeps the gates of corporatism in place.